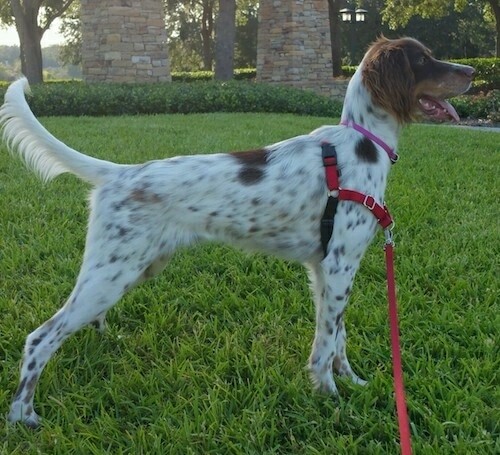 Lacey the Llewellin Setter at 6 months old—"Lacey is very energetic and always on the hunt. She pays more attention to lizards, butterflies, and birds than humans or other dogs. Lacey is very friendly towards people, no aggression at all. She is great with kids, small dogs, and cats. She seeks out attention when she is bored, but she is a joy to entertain. 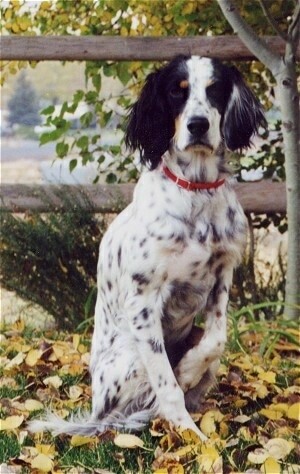 :)"
The Llewellin Setter is a very gentle, calm dog. Friendly and excellent with children, it is mild mannered, loving all the affection it can get. Enthusiastic and lively outdoors, but relatively inactive indoors. With meek owners it will become willful. Can be difficult to housebreak. Rules, structure and training should start early to prevent development of bad habits. This breed needs authoritative, calm, but firm, confident and consistent owners, but should never be harshly treated. Needs a lot of structure and enjoys playing with other dogs. Llewellin Setters are adequate watchdogs. They like to roam and are diggers and good jumpers. Owners need to be firm, but calm, confident and consistent. Proper human to canine communication is essential. All setters need a daily long, brisk walk or they will become restless and difficult to manage. In addition, they will also enjoy running free in the safety of a fenced yard. While out on the walk the dog must be made to heel beside or behind the person holding the lead, as in a dog's mind the leader leads the way, and that leader needs to be the human. Regular combing and brushing of the soft, flat, medium-length coat is all that is required to keep it in excellent condition. It is important to check for burrs and tangles, and to give extra care when the dog is shedding. Bathe or dry shampoo only when necessary. Trim the hair on the bottom of the feet and clip the nails. This breed is an average shedder. 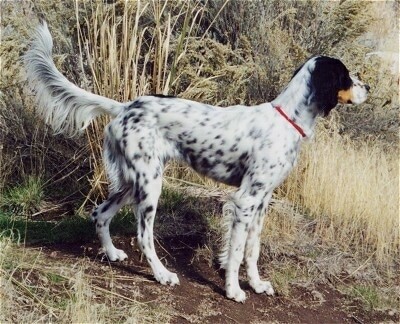 The Llewellin Setter was bred out of English Setter lines by an English breeder named Llewellin. 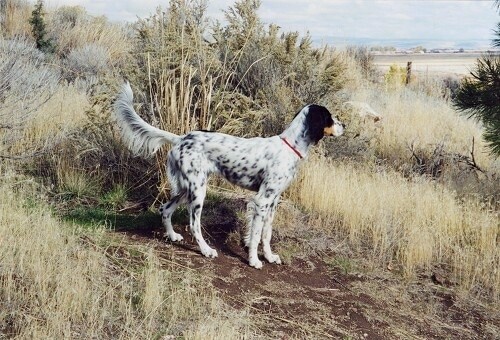 The word "setter" comes from the way the dogs appear to almost be sitting down when they discover game. 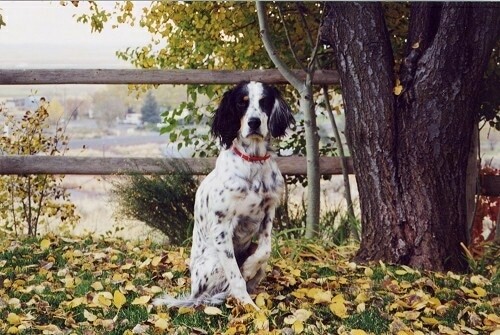 The Llewellin Setter's talents include hunting, tracking, retrieving, pointing, watchdog and agility. 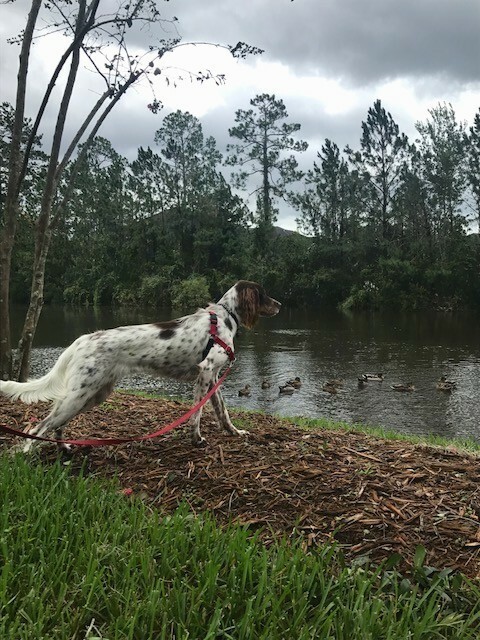 Lacey the Llewellin Setter at 1 1/2 years old—"Lacey is still the same sweet pup that she was when she was younger. Her primary focus is running and chasing squirrels, bird, and bugs. She interacts well with people and dogs but can be hesitant to meet new people at times. She is a great family dog and gets along very well with our resident cats. I am beyond happy to be the owner of a beautiful Llewellin Setter!!"